The Library Voice: Creating Back-To-The Library Bookmarks! We have been getting our library ready for Back-to-School Night and the first days of school. Jessica, Diana and I can't wait to greet all of the students, teachers and families next week as we kick off an amazing new year in the Van Meter Library. 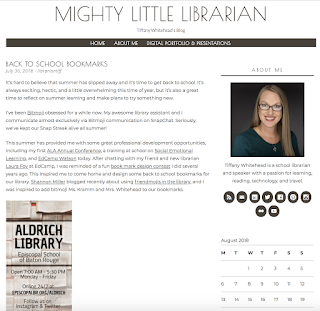 As we do this, a lot of what we are doing during those first few weeks is building community and sharing the important information about our library. We have created displays, signage, an online newsletter and new library website. In the past, I have created little business sized cards to hand out at the beginning of the year to everyone. These have been a big hit and we plan to do this again as they like how easy these are to tape to their laptops, put in their pockets or billfolds and take home to use anywhere. And this year we are also going to have an extra special new treat thanks to an idea from my friend and librarian Tiffany Whitehead. 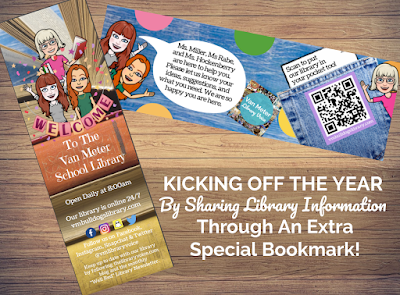 On her blog, Tiffany wrote about and shared the most adorable bookmarks to kick off her year too. You can read her post here. 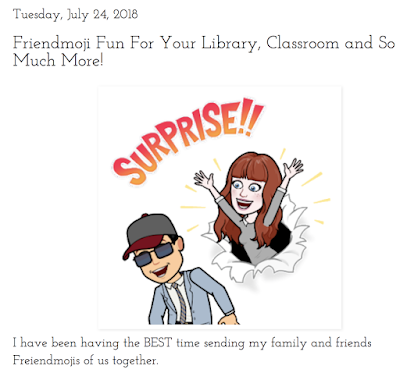 I loved being able to use Bitmoji to create our friendmoji for our brand new library bookmarks. The students will love seeing the three of us in Bitmoji style. If you haven't made your own friendmoji yet, read more about how to in this post I wrote. We were able to add all of the important information like the hours we are open, our library website and "Well Red" Newsletter, and where to find the @vmlibraryvoice on Facebook, Instagram, Snapchat and Twitter. We also added a QR code so they can easily scan it to "put the library in their pockets" on their devices too. I did add the url to our library site again underneath the QR code too. 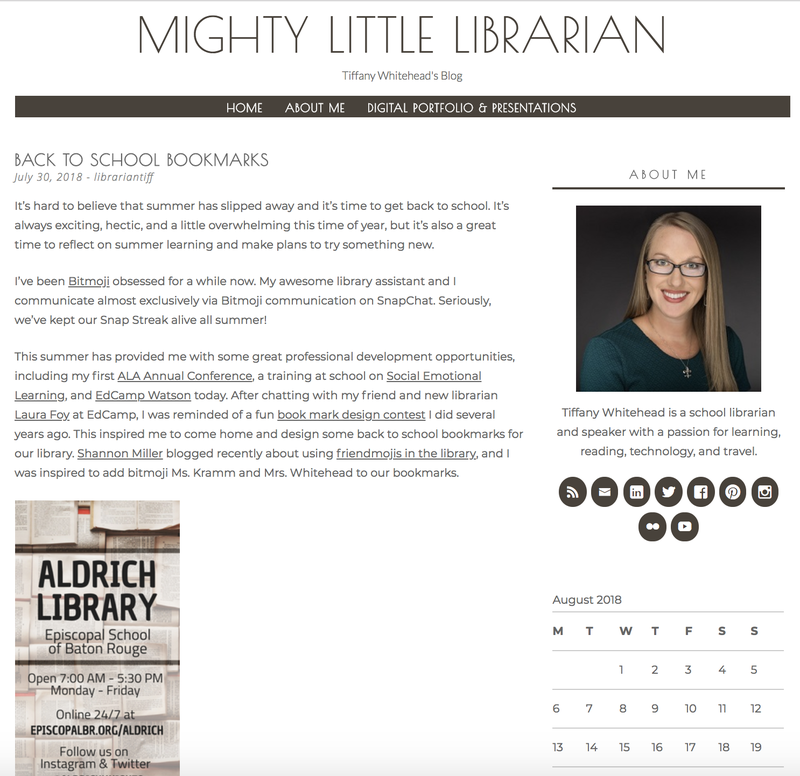 Ohhhh and a nice little handy tip for your library site.....I bought vmbulldogslibrary.com from GoDaddy and then pointed the Google Site for the library to that special url. It makes it so much easier for everyone to remember since our school website is vmbulldogs.com. We ordered our bookmarks from Overprints.com like Tiffany did. The biggest thing to check before you order are the dimensions and boarder around the outside edge. You don't want anything to be cut off. Bring on a new year....We are excited, inspired and ready with one more tool for us to connect to our community in wonderful ways. TCEA 2019 Is Coming At Us Fully Charged! 4 New Breakout EDU Games for Back To School Time! Standards For Collections Are Here!